For other mountains of the same name, see Purple Mountain (disambiguation). Purple Mountain or Zijin Shan (Chinese: 紫金山; pinyin: Zĭjīn Shān; literally: 'Purple-Gold Mountain') is located on the eastern side of Nanjing in Jiangsu province, China. It is 448.2 m (1467 ft) high, with the lowest point 30 m (98 ft). Its peaks are often found enveloped in mysterious purple and golden clouds at dawn and dusk, hence its name. A small mountain with an area about 20 square kilometres (4,900 acres), Purple Mountain is a mountain related to many historical events of both ancient and modern China. It was originally known as Bell Mountain (traditional Chinese: 鐘山; simplified Chinese: 钟山; pinyin: Zhōngshān) and also became known as Mount Jiang (traditional Chinese: 蔣山; simplified Chinese: 蒋山; pinyin: Jiǎngshān) after Sun Quan named Jiang Ziwen, an Eastern Han official whose spirit was said to haunt the site, as the mountain's god during the Three Kingdoms era. The name Zijin (紫金) means "copper" - when copper is pure, it appears purple in colour, so in Chinese it's also called purple-gold. It is also named Mount Jinling (金陵山), due to its purple rocks. Jinling means "the mount of purple-gold". 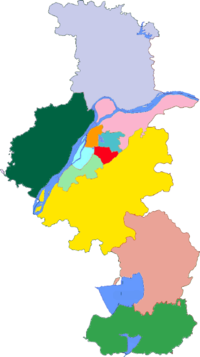 It is the origin of the nickname "Jinling" (金陵) of Nanjing. During the Ming dynasty, it was also called Mount Shenlie (神烈山). More than 200 heritage and scenic tourist sites are now located in or around the mountain, including three national historical sites, nine provincial historical sites, and 33 prefectural historical sites. Located in or close to the hillside of the mountain, there are also about a dozen national research institutes and universities. The Sun Yat-sen Mausoleum, the tomb of Sun Yat-sen, is located at the foot of the mountain. Purple Mountain has 621 species of vascular plants, from 383 genera, 118 families (including 78 cultivated species). ^ a b 测绘局公布盘山等第二批31座著名风景名胜山峰高程新数据. The central people's government of the people's republic of China (in Chinese). 2008-09-28. Retrieved 2017-05-28. Wikimedia Commons has media related to Purple Mountain.